See this check … this one right here written out for $54,863 ? I call it a freedom check. A check that’s 10 times bigger than the average annual return from a U.S. retirement account. And THREE-and-a-HALF times bigger than the average annual benefit from U.S. Social Security. In fact, depending on how much you invest, you could see freedom checks ranging from just a few hundred dollars to hundreds of thousands of dollars. Take Doug Smith, a 46 year old from Joplin, Missouri. He’s set to grab FOUR freedom checks next year for $31,055 each. That’s a total annual payout of $124,220. Lisa Luhrman — a 57 year old in Tulsa, Oklahoma — is set to cash even bigger checks of $66,570 for a total annual payout of $266,280. And Mike Reed — a 53 year old from Golden, Colorado — he’s going to be awarded FOUR massive checks of $160,923 … for a whopping annual payout of $643,692! Of course, Doug, Lisa and Mike’s investments were much larger than the typical investor, but the potential here is undeniable. In fact, you could collect these payments automatically — typically every three months … quarter after quarter … like clockwork. You’re about to join an elite few who have gotten all the details on one of Washington’s best kept secrets. Must pay out lucrative freedom checks out to all stakeholders, with the amount determined by the size of an investors financial stake in the company. Just know that this special designation could be the golden solution for anyone looking to secure their retirement outside of relying solely on Social Security. Fact is, even the savviest of investors are cashing in on freedom checks. Lloyd Blankfein of Goldman Sachs banks more than $8.9 million in freedom checks. Hedge fund manager and presidential advisor Robert Mercer is set to grab up to $7.1 million every year. And Fayiz Sarofim, the owner of the Houston Texans, is set to collect $2 million in freedom checks each year as well. You can get started with a check just like this one right here as soon as next month thanks to this special designation that authorizes 568 agencies across the country to dole out this money. To be clear, this is not a government program … it’s not like Social Security or Medicare or anything like that. It’s much better … there are no age requirements and the payouts can be much much higher. And it’s no wonder … according to our research, these agencies are slated to pay $34.6 billion dollars over the next year to any American taxpayer with a claim on the cash. Yes, you heard me right … $34.6 billion dollars. I’ll show you exactly how to stake your claim in just a moment. But you must act now because these payments could start as early as next month. In fact, go ahead and mark the following dates on your calendar so you know exactly when to expect these checks. On the 15th, two agencies … one in Atlanta and one outside of Seattle … are set to pay out $5.2 million and $68.5 million respectively. And on the 30th, another in Dallas is set to payout $3.2 million. That’s four different checks in one month alone. And depending on the size of your stake, you could collect as much as $1,000 … $5,500 … $12,000 … and even $36,000. That’s like getting four massive Social Security checks in a single month or getting a paycheck every week without having to work a single minute. Best of all, you can start getting these checks today, regardless of your age, income or the state you live in. I’ve already shown a few people just like you how to grab checks like this and they made out like bandits. 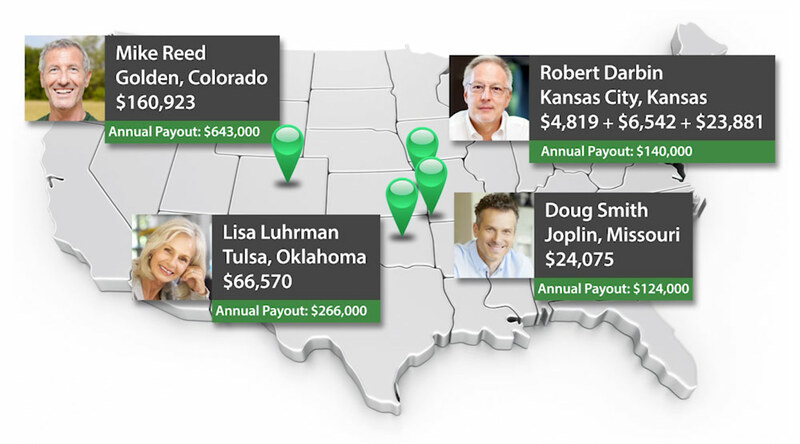 Now these are some of the best examples folks have seen over the years — but frankly, even an average freedom check opportunity could be the key to securing your retirement for the rest of your life. And starting next month, you too can start cashing in on these freedom checks and use the money however you would like. Perhaps to retire on your own terms … when you want and anywhere you want. Or perhaps you will use this money to buy that vacation home you’ve always dreamed about or to purchase that luxury car you’ve wanted for as long as you can remember. Whatever your financial dreams, there is NO limitation to what you can do with these freedom checks once you stake your claim. That’s what happened to Brad Bollen, a 47 year old from Laramie, Wyoming. He’s set to grab FOUR freedom checks next year for $58,184 each. That’s a total annual payout of $232,737. John Hastings — a 63 year old from Boston, Massachusetts — is set to bank even bigger checks of $95,571 for a total annual payout of $382,287. And Rod Fein — a 60 year old from Ruston, Louisiana — will cash FOUR massive checks of $343,406 … for a massive annual payout of $1,373,624! Now, again, the more you invest ... the bigger the freedom checks, but as you can see, if you know where to look and how to invest in this unique income vehicle, you could make an absolute fortune in the months and years ahead. And make no mistake, many of my readers … many of whom are just like you … have used their own channels and initiative to grab tens of thousands from their own freedom checks over the years. People like Bill Watson from Madison, Wisconsin, who told me he’ll receive $28,800. Sarah Torin, from Sacramento, California, who said she’ll grab $60,000. And Stanley Dorne from Chicago, Illinois who will bank over $285,000. But in order to do this, you must get started immediately. As in right now, within the next hour. Because these 568 agencies from all over America are set to pay out as much as $34.6 billion starting next month. Each of these agencies are on a set schedule with their freedom check payouts. Some pay monthly, some quarterly or some pay once a year. But if your name is not on their list ... that money will go to someone else. Big money, like the $897 million that’s expected to be paid out from an agency in Toledo. The $675 million to be paid out from an agency in San Diego and another $1.6 billion to be paid out from another in Houston. Plus, another $1.9 billion to be paid out of an agency based in New York City. This agency is expected to payout a total of $661 million, this one $974 million and this one $3.3 billion. All told, there are around 568 agencies that have the authority to write these checks. And everyday taxpayers from all walks of life are reaping a windfall. 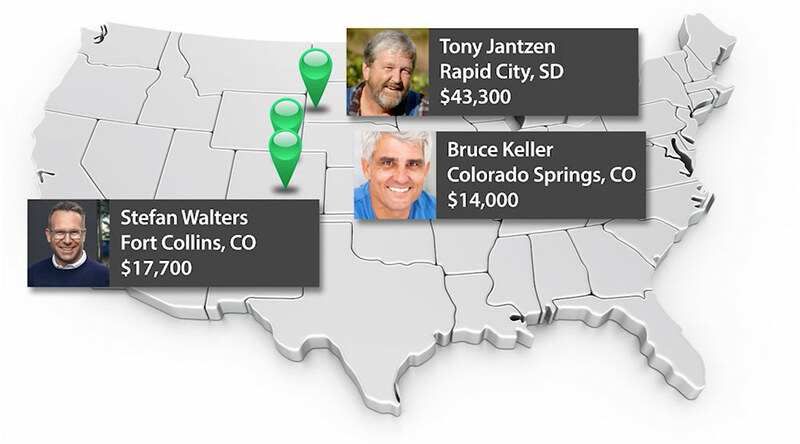 Tony Jantzen, a South Dakotan , is already set up to get a freedom check from one of these agencies in the amount of $43,300. Stefan Walters, is scheduled to get a check for $17,700. Bruce Keller, is set to grab his check for $14,000. And remember, Tony, Stefan and Bruce are set to get these checks every three months ... quarter after quarter ... indefinitely. And this check … like the one I’m holding right here … could be yours if you take action today. These 568 agencies could start doling out as much as $34.6 billion in cash next month. And if your name isn’t on their list, that money will go to someone else. I’ll even show you the top five companies where you can get the biggest bang for your buck … setting you up for 44 supercharged freedom checks over the next year. That’s about one freedom check showing up in your mailbox, or being directly deposited into your bank account every week. 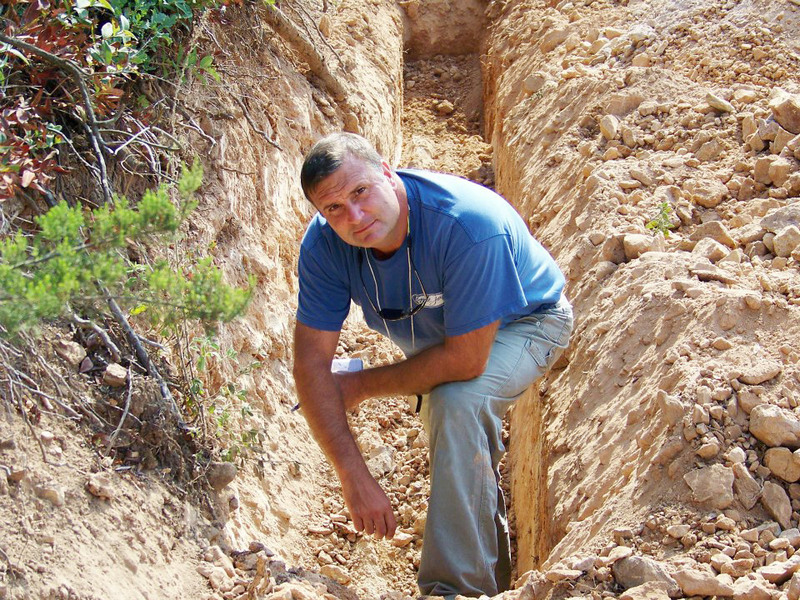 But first, I should tell you a bit about me and how I … a geologist of all people … discovered these freedom checks. My name is Matt Badiali. And yes, you heard me correctly, I’m a geologist. I was teaching at the University of North Carolina when I got a call from a famous financial expert … a man who has made over a billion dollars selling privileged research to some of the world’s elite investors. This financial expert asked if I could help him on a special project. He wanted to invest in the energy, mining and natural resource sector. However, he knew that if we wanted to get exceptional returns, consistently, he needed a geologist on his team. So he asked if I would like to join them. My job would be to travel the world and visit specific companies to make sure that what they said on paper was actually true on site. 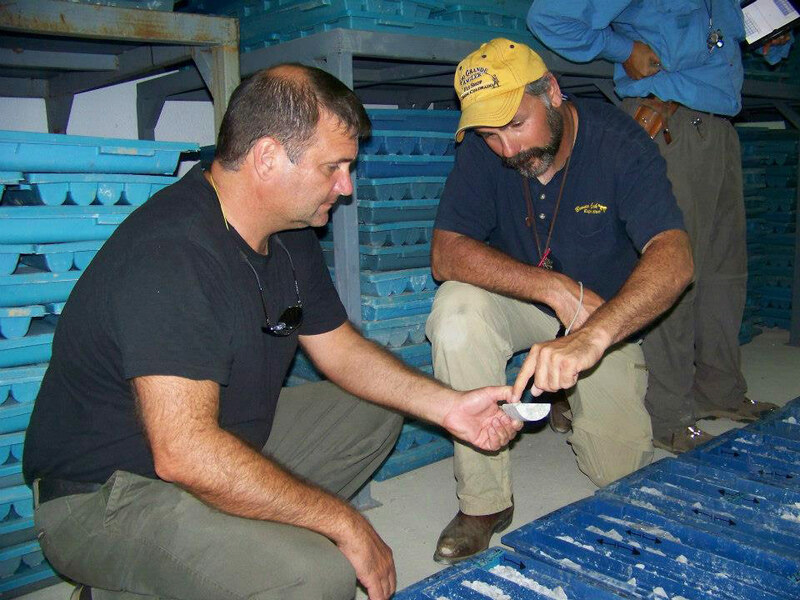 I would assess core samples from gold mines, analyze onsite field maps and examine oil wells as they operated. The idea of traveling the world was intriguing. And when he offered to increase my paycheck fivefold and teach me everything he knew about investing … I signed on and never looked back. I’ve been traveling ever since. From places like Singapore … to the Yukon ... to Iraq ... to Hong Kong ... to Vancouver … to Papua New Guinea ... and a Mexican desert. I’m always meeting with mining and oil company CEOs, resource investors and precious metals experts to stay in the know on the latest technologies, discoveries and trends. For example, I’ve met with legendary oilman T. Boone Pickens, and I’ve presented my findings to billion-dollar behemoths like Anadarko and ExxonMobil. I’ve worked on drill rigs and explored abandoned mines ... all in order to make profitable investments in natural resources. I’ve even owned oil wells myself. One of my top speculative investments was in the heart of the 2008 stock market crash. On December 5, 2008, I bought a 6 cent mining stock by the name of Kaminak Gold Corp.
My friends and family thought I was crazy. However, while the stock market dropped by 50%, my position shot up. I sold it on August 26, 2010, for $2.64. Every $100 I invested turned into $4,400. I don’t feel comfortable telling you exactly how much money I made, however … let’s just say I live in my dream house a few steps from the beach. And as for the famous financial expert who hired me do this research? It worked out well for him too. I’ve seen an enormous amount of cash flood through the doors of his research firm from my recommendations. In fact, at my last research firm I beat all my colleagues in a performance contest … including a former hedge fund manager and Goldman Sachs trader. And received the research firms highest award for my performance. In fact during my tenure I saw 16 triple digit winners as high as 262%, 345%, and even 597% (some in as little as 10 months’ time). Now, I don’t share all this to brag … I just want you to know that when it comes to identifying and seizing huge opportunities, I know how to find them. Hence when I stumbled upon these freedom checks during an intense research project I had to dig deeper. They simply seemed too good to be true. But once I figured out where all the money is coming from … and how they are derived from the “last truly bipartisan policy” from Washington, it made all the sense in the world. As a warning, some of what you are about to see is controversial. But if you are openminded to finding new ways to make money with little risk, I think you could become incredibly rich. You see, these freedom checks have their origin in the belief that if the United’s States of America is to remain a FREE nation, we need to be self-sufficient. However, most Americans have no idea we send over $535 billion every year to foreign countries for natural resources such as oil, metals and agriculture. That’s 100 times more money than we spend on border patrol. And the worst part is that most of these foreign countries getting our billions of dollars are not only hostile to America, they actively support terrorist enemies with our own cash. Frankly, it makes my blood boil. Here’s the thing … it doesn’t have to be this way. According to a prominent geological survey, there are $128 TRILLION dollars’ worth of physical assets within the borders of the United States. I’m talking about massive resources from oil and natural gas ... to core metals like steel and aluminum … and even precious metals like gold and silver. To put this $128 trillion in perspective, we could use these assets to pay off our mountainous federal debt … six times over. Or even fund our Social Security obligations … for the next 150 years. Bottom line — it makes zero sense for us to send $535 billion to hostile foreign countries every single year when we can make money from the $128 trillion of untapped resources right here at home. That’s why every president since Nixon has been working on a way to make our country truly sovereign … independent, self-sustaining. Nixon said: “Our independence will depend on maintaining and achieving self-sufficiency,” and he pushed for a program like this from the moment he took office. In sum, our country has been fighting this battle for over 50 years … but we still send $535 billion in U.S. dollars to foreign countries. That’s why this “freedom check” opportunity is so critical. After five decades of battle, we may have the perfect solution thanks to these freedom checks. The law that made it all possible … Statute 26-F .
Obviously, operating anything TAX FREE is a massive incentive. And with a corporate tax rate of nearly 40%, it’s easy to see why companies would jump at an opportunity like this. They would much rather pay their stakeholders billions upon billions of dollars versus handing money over to Uncle Sam. Yet, of the 16,000 publicly traded companies, only around 568 meet these strict guidelines to become designated companies that are set to cut $34.6 billion in freedom checks over the next 12 months. $3.3 billion will be paid from agency company in Houston, Texas. $1.8 billion will be paid from one in New York City. $672 million will be paid from another in San Diego, California. Now thousands of Main Street Americans have lined up for the chance to get their fair share as well. All they had to do was buy shares of a company that’s achieved the right designation, just like they bought any other stock and then collect the payouts. And if you act today, you can join the likes of Phil, an accountant from Oklahoma. He is scheduled to cash his freedom check for $215,000. Harry, a transportation advisor in Louisiana, will collect $411,000. Greg, a former corporate secretary, will grab a massive freedom check for $837,000. Alex Freemont from Michigan wrote me to say he’ll collect $30,000 in freedom checks this year. Gerry Falzone from New Hampshire says he’ll get nearly $100,000 this year. And Jim Horvath from Georgia told me he’s raked in more than $900,000 and that’s just the start as his freedom checks continue to pile up. Now again, these are some of the best case scenarios. And while nothing in the market is guaranteed — you have an opportunity today to turn your retirement account into a cash machine for the rest of your life. In fact, there are some freedom check opportunities that could easily take a $148,000 nest egg and pay you over $54,863 every year — giving you the chance to pad retirement for years to come. The bottom line is that there is a fortune to be made in freedom checks, and I want you to be a part of it. You see, anyone — regardless of age, net worth or investment experience — can start receiving these checks and then use the money however they want. It doesn’t matter if you are a Wall Street titan raking in $10 million a year or the guy next door raking in a few extra grand a month. 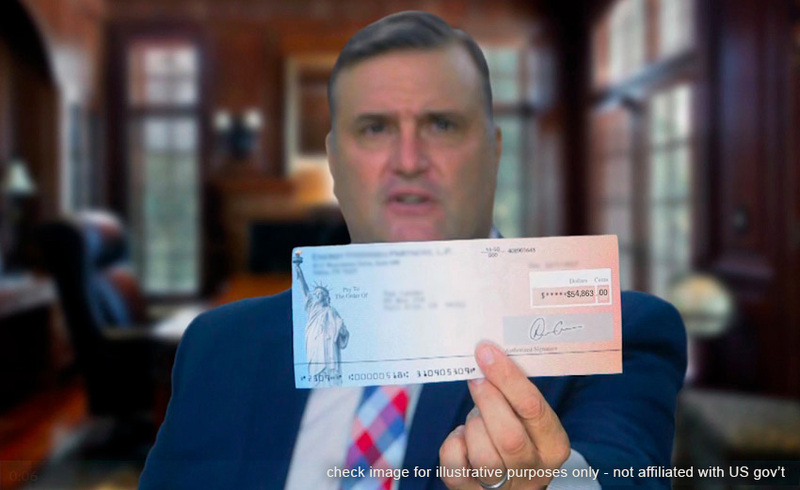 In fact, you can activate a freedom check account with this 10-dollar bill and you will be set to get automatic freedom checks … every single month. If you took $1,000 and rolled it over in a CD for 20 years … you would get payouts totaling $320. Investing that money in corporate junk bonds at 6% would pay you $2,207 … and if stocks go up 8% a year, you could make $3,660. But that same $1,000 allocated to just one freedom check opportunity could payout as much as $149,300. That’s a return of 14,930%. If you put aside $10,000 today … over the next 20 years, you could get total payouts amounting to $1.5 million! 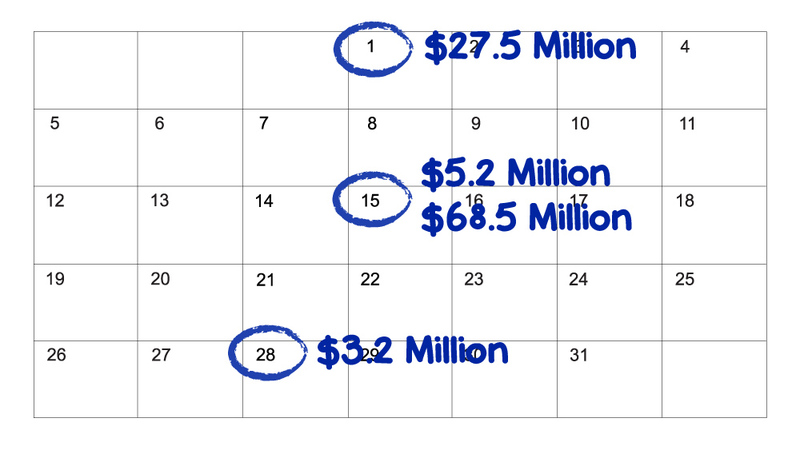 And if you put aside $100,000 today … over the next 20 years, your payouts could explode to $15 million! And while this may be the best-case scenario, the potential here is clear. 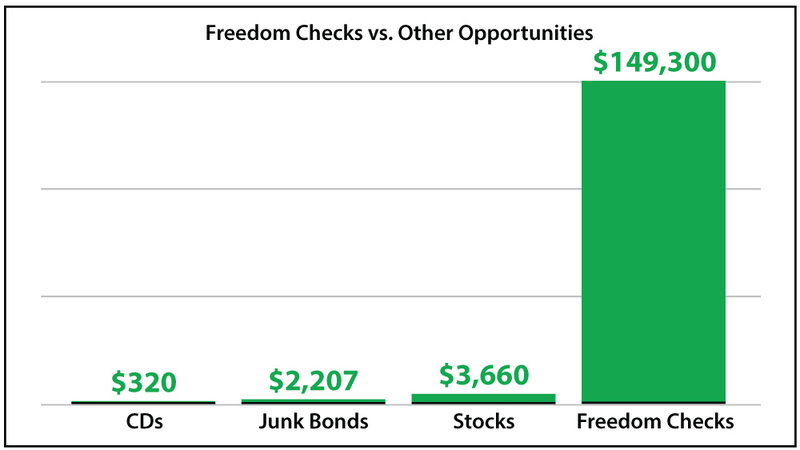 Perhaps you can see why I think these freedom checks are better than standard 401(k)s or IRAs, insurance policies, annuities and well, every other investment out there. They even make Social Security payments look paltry. Fact is, the average two-earner home pays more than $722,000 into the Social Security program during their working life. 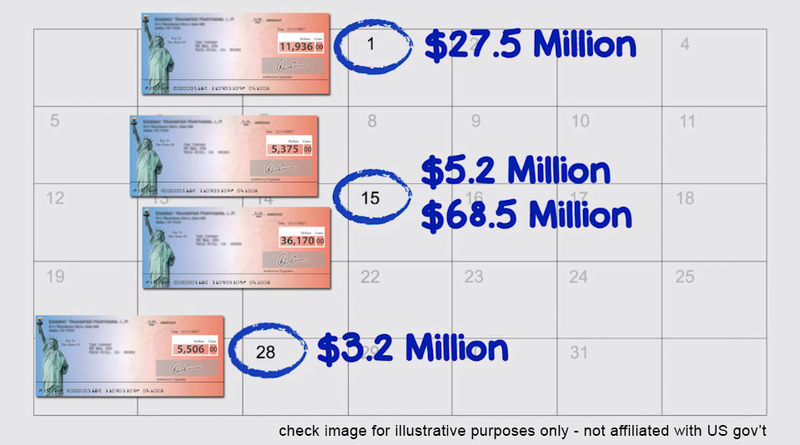 You could start grabbing five-digit checks up to two, three even four times a month starting today no matter your age. It’s a way to secure your retirement without relying solely on the government. And since the potential financial backing of freedom checks is 45 times bigger than those backing Social Security, you’ll never have to worry if these companies will be there when you need these checks the most. 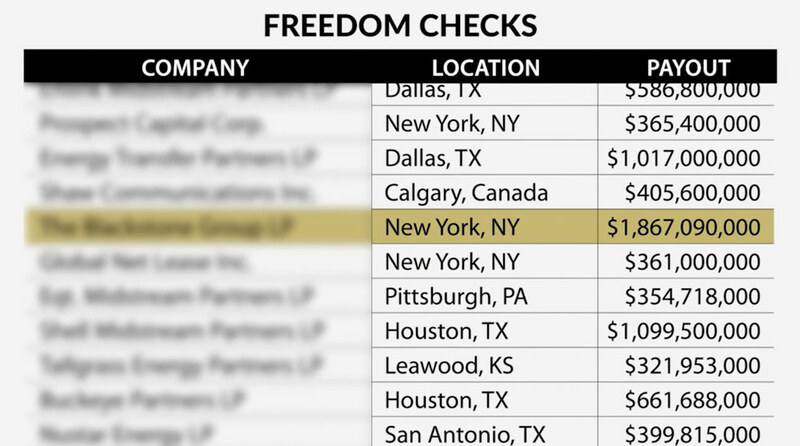 You can see why I’m so excited about these freedom checks and why I’ve been telling everyone I know how to get them. I’ve never seen a windfall like this. But you must sign up today. These companies will wait for no one and if you want the best opportunity to take advantage of them, you must be up and running before the next round of payouts start next month. And here’s the really great news … I’ve already done all the hard work for you. I’ve spent the last three years and hundreds of thousands of dollars researching and analyzing every detail of these unique entities ... all with a single goal of finding the top five that can have you cashing in on your first checks right away. I will tell you more about these five in a moment … where they operate, how much you can expect them to pay out, and how to invest for practically pennies on the dollar… but first, it’s critical that you understand how I narrowed them down to make sure you only get the cream of the crop. I use these exact rules to make sure that my investments are as guaranteed as possible. I honed and mastered these rules from working with an entrepreneur who’s built a near billion-dollar enterprise. They are the same rules I used to make cumulative gains of 2,672% for my readers. First, the company must have $1 billion or more of a natural resource deposit at its fingertips. Be it oil, natural gas, gold, silver or rare earth minerals, I’m looking for companies that own or control billions of dollars in raw materials. These are “in-demand” assets that impact every facet of our lives from the cars we drive ... to the medications we take ... to the more than 300 million smartphones we use every day. You name it, these raw materials are in it. To gauge this, I typically visit the company onsite. I look at its core samples, I drive its machines, I walk through its mines, I talk to the employees. This is what I was trained and paid to do for the last decade. The second rule is consistent or increasing fat payments. Even with ownership or control of billions in assets, if a company isn’t turning those assets into consistent cash payouts to investors, I don’t want anything to do with it. I want consistent, fat payouts. Many of the companies that make it to the top of my list are so profitable they actually increase their payments every year. For example, one company has increased its freedom checks payouts every year for 10 straight years … and they show no signs of stopping. Another one based in Midland, Texas, increased its freedom checks payouts by 76% … this year alone. While another one increased its payouts by 138% … and yet another by 150%. That would never happen with Social Security. But that’s exactly what happens with these freedom checks. And trust me, it happens … ALL THE TIME … with these companies. Thirdly, the company must have a proven track record of making investors rich. After more than a decade traveling the world, meeting with CEOs and their teams face to face, I can’t tell you how many times I’ve seen an “A” team take a “B” opportunity and turn it into a massive cash cow. 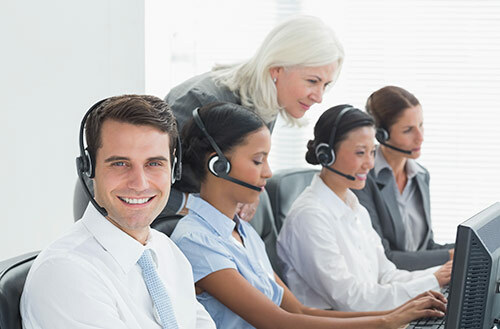 The bottom line is that success breeds success, and proven management teams know how to squeeze every last penny of profit out of their operations. And with the thousands personal contacts I’ve amassed thorough the years, I know exactly which management teams have the Midas touch. Doing research like this is the exact reason one of my readers wrote me saying he made $900,000 in an investment. And lastly, I want to see bulletproof financials. I look at everything from debt structure to free cash flow, and more than a dozen other metrics that give me a clear picture of the company’s financial health. I mastered skills while working under the billion-dollar entrepreneur. Even the savviest of Wall Street experts don’t have the skillset I have that allow me to know what to buy, when to buy and when to sell. Now obviously, I am just touching on each of these rules. 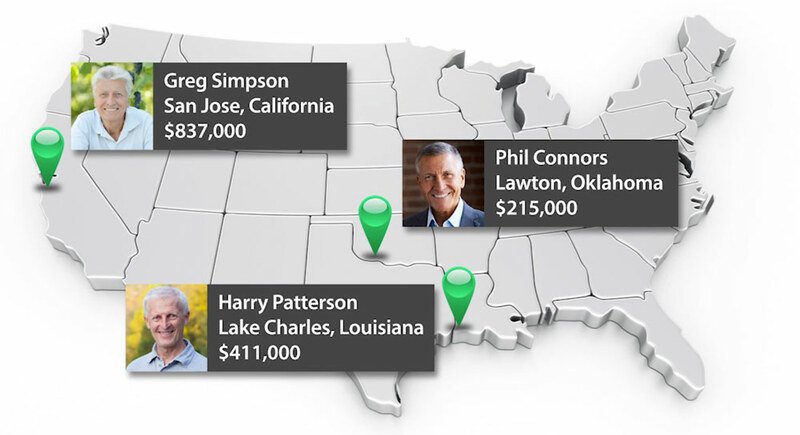 I’ve spent over three years studying these government designations and the companies that have gotten them, seeing how people from all walks of life collect these massive freedom checks month in and month out. And I’ve already seen firsthand how this program has already played a role in making America more self-sufficient. In fact, just recently … for the first time in 6 decades … the United States was a net exporter of Natural Gas! I’ll take that win and celebrate it as a start to a bigger victory! I’m personally proud to be a part of it. You are steps away from cashing your own freedom checks as these companies start dolling out $34.6 billion starting next month. As mentioned, to get started, you buy shares of these companies just like any other stock out there. So these companies I’ve identified don’t just pay out these big freedom checks, they have also racked up huge capital gains. The type of gains that can normally only be seen with risky investments like microcap stocks or leveraged investments. I’m talking about massive moves with gains from some hitting as high as 5,889% … 8,839% … and even 39,832%. That’s enough to turn every $1,000 invested into $398,000 and every $10,000 into $3.98 million. And right now there are multiple companies with prices that are a screaming buy under $10. So, after spending thousands of hours vetting each of these companies using my four guaranteed payout rules, I’m pleased to say that I’ve narrowed the list down to the top five you need to own today. This Houston based company is expected to payout $19 million next month. And after a 130 years of printing money for financial titans ranging from John D. Rockefeller to Goldman Sachs, this company's next round of freedom checks is only the start of the money you can grab in the weeks and months ahead. And when you do, you’ll join people like John Saur, an engineer from Allentown, who is set to collect his freedom check for $44,453 from this company. Frank Smith, from New York, is set to grab his check for $38,140. And Bill Markey will get a massive check for $121,818. 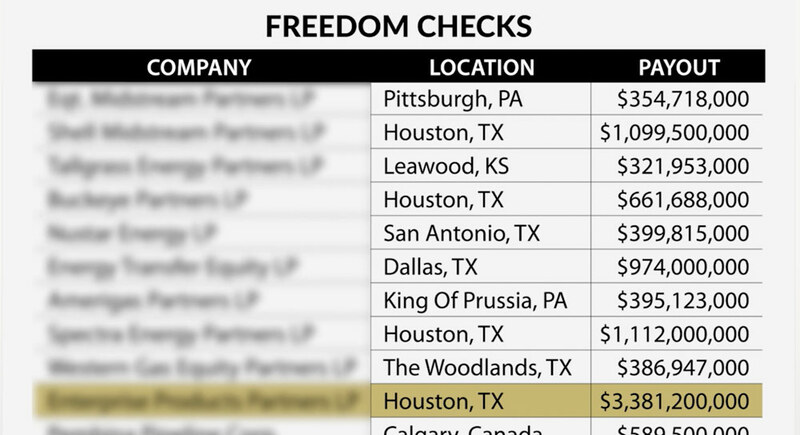 Based in Dallas, this company is moments away from paying out $34 million in freedom checks. A massive sum it pays out to everyday folks … every three months … like clockwork! Of course, it’s easy for this company to make these massive payments as it rakes in cash from an estimated 11,000 miles of pipelines, 20 processing plants and 4.8 billion cubic feet of resource processing. Depending on how much money you put in, you could easily see freedom checks totaling $13,400, $27,000 and even $54,000 in the days ahead. One man from from New York City named Bryan Felt had his firm score a huge stake as part of an acquisition. They can expect to amass an absolute fortune in ”Freedom Checks”. What I love about this company isn’t just how much natural resources it’s sitting on … it’s how it hauls in $3.6 million per employee. That’s 50% better than Apple and twice as strong Google … yet its stock can be scooped up for one-twentieth the price. It’s already lined up to pay out 12 checks amounting to $953 million. You can get all the details on these three companies along with two additional ones that will line your back pocket up with 44 freedom checks in my new report called The $34.6 Billion Payout. This report is valued at $199 … but it’s yours for free today. 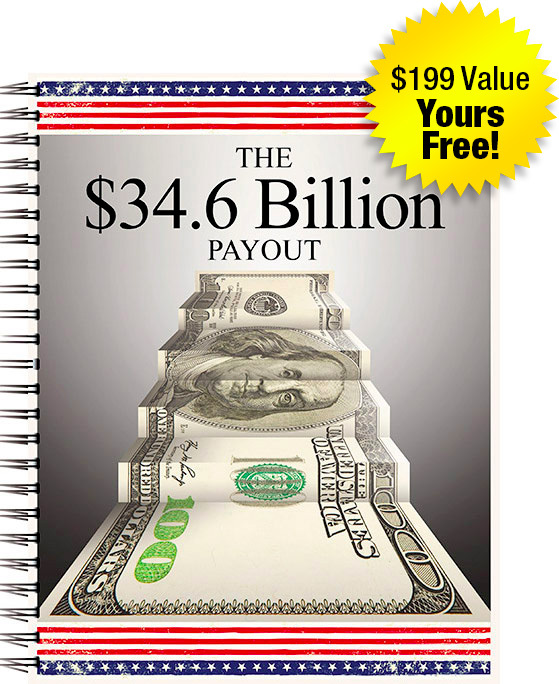 You’ll see how much you can expect to get every month from this $34.6 billion cash grab. And you’ll see how much you can expect your payments to rise in the years ahead. You can get set up and running with these freedom checks in the next hour if you would like. However, this free report is just the start. You’re about to get so much more. As I mentioned, I’ve spent my entire financial career picking some of the greatest natural resource stocks on the planet. It worked out very well for the billion-dollar entrepreneur who hired me to do this research as well as for those who have had the opportunity to rack up massive triple-digit gains along the way. This is a chart of Silver Wheaton. It’s one of the largest pure play silver miners in the world. Within 18 months of my recommendation, this company soared 335%. AuEx Ventures — a junior gold miner, was another recommendation of mine. It was looking to be bought out by a bigger firm. Within months of my buy recommendation, the company was acquired giving us a juicy gain of 198%. Then there’s ATAC Resources. This drilling and exploration company soared after a big discovery in the Yukon giving us an explosive 343% gain and one of the biggest wins my boss’ firm has ever had. 46% gain on Fronteer Gold. 269% gain on Silvercorp Metals. 156% gain on MAG Silver. 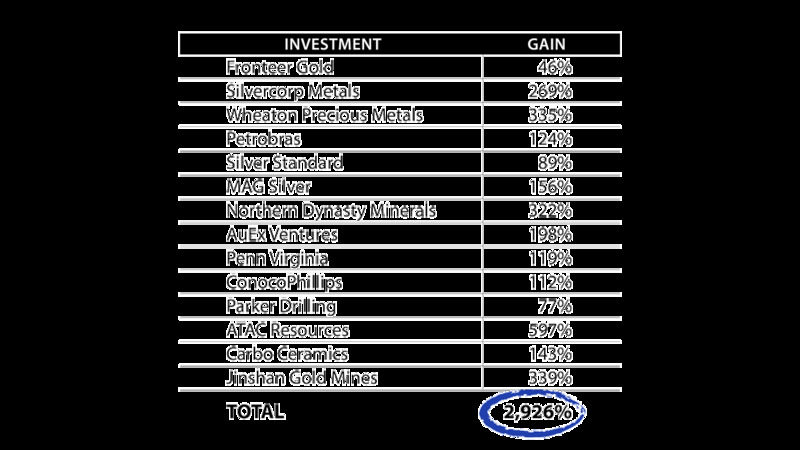 322% gain on Northern Dynasty Minerals. 119% gain on Penn Virginia. 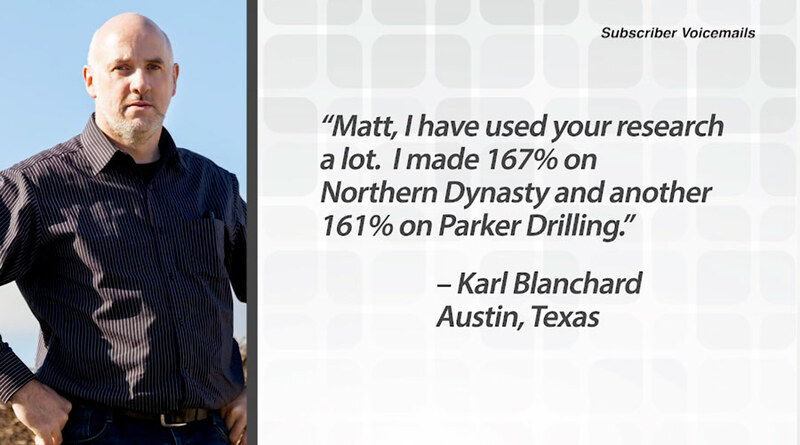 77% gain on Parker Drilling. 143% gain on Carbo Ceramics. And 339% gain on Jinshan Gold Mines. That’s 16 triple-digit winners with a collective gain of 2,672%. That’s enough to turn every $1,000 invested into $26,720. Which is why I’m going a giant step further. In addition to getting The $34.6 Billion Payout for free, I want to give you immediate access to two more free reports that reveal my top two investment picks. The first is called The Mining Coup of the Millennium. 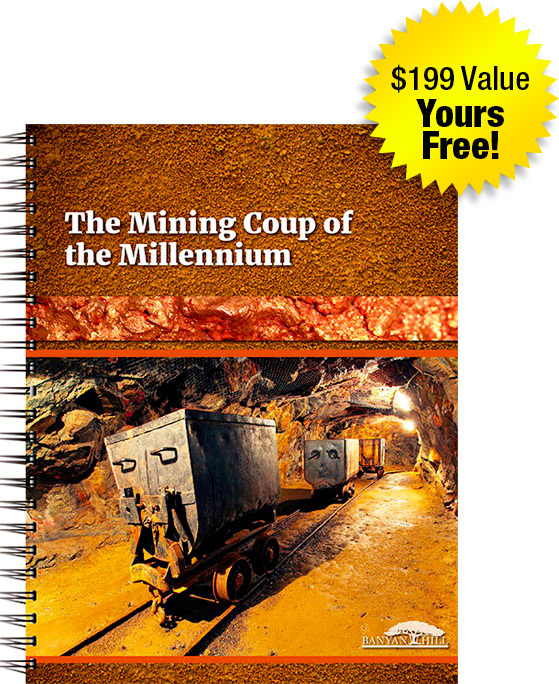 In this report, I give you all the details on a $7 billion mining company that is sitting on a 25-billion-pound copper deposit … in addition to 12 million ounces of gold … and a staggering 78 million ounces of silver. Investors who get in on this stock right now could easily see gains of 300% or more in the next few months. Your second free report is called "Magic" Metal Riches. 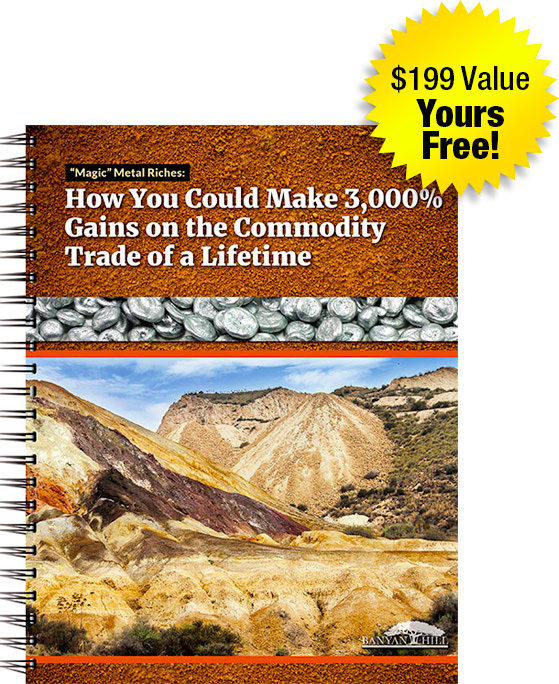 In this report, I show you how a massive shortage of one of the world’s most important metals — a “magic” metal that is used in everything from iPhones, cars and skyscrapers, to pharmaceuticals, medical equipment and cosmetics — has led to one of the most profitable precious metal discoveries of my entire my career. And the company that mines it has the potential to skyrocket 3,000%. As a warning, the company in this report is speculative. It reminds me of the time I made 4,400% in Kaminak Gold Corp … turning every $100 I invested into $4,400. The opportunities I’ve laid out for you in all three of these reports are far too valuable to pass up. 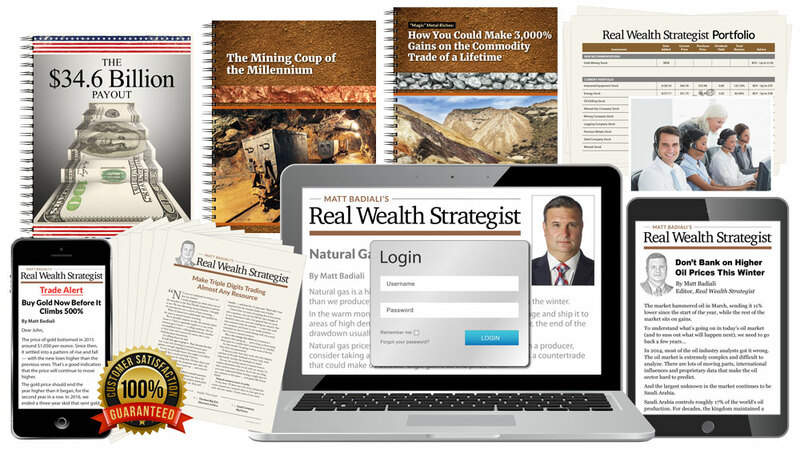 The investments I’ve outlined could totally transform your life … making you wealthier than you ever imagined. And I want to send them all to you absolutely FREE, despite the $597 value. I have something packed with even more profit potential for you. You see, about a year ago, I stopped working for the billionaire entrepreneur to begin a new venture … a venture designed to help you make the same type of fortunes I showed him. 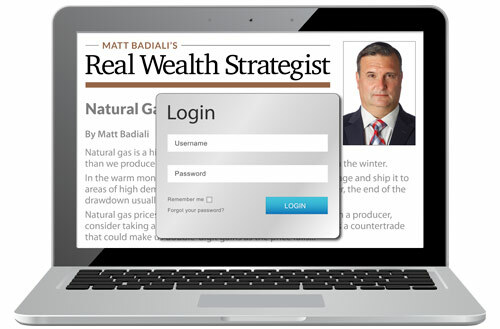 That new venture is a research service called Real Wealth Strategist. And I’d like you to try it out, 100% risk free. 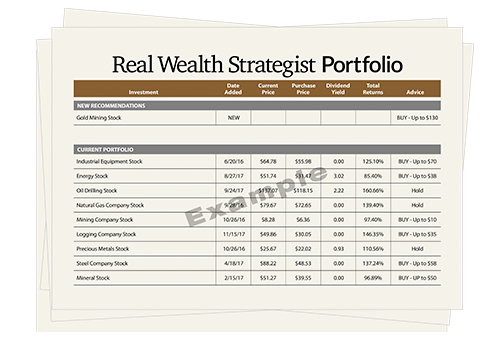 In sum, Real Wealth Strategist gives you access to me … it allows you to look over my shoulder at my model portfolio, to join me on my journeys to these companies and to get my insights on investing … the same way the billionaire entrepreneur did. The moment you become a member of Real Wealth Strategist (which again, you can do absolutely risk free) you become part of my “inner circle” — and you’ll get access to my research ... and all of the investment opportunities I uncover each and every month. With these weekly updates, you will never be left in the dark. Once a week, I will reach out to you. I will update you on our current positions and what’s happening in the markets. My team and I are always watching these positions. 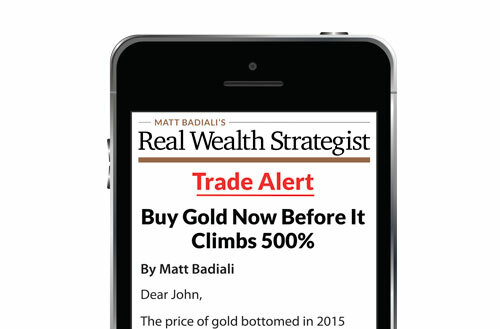 When it is time to trade a position, I will send you an easy-to-read trade alert via email. The email will tell you exactly what to do. And with today's technology, if you choose to invest, you could make the trade over your phone, on your desktop or with your tablet. It’s really that easy. This is by far my favorite part. Every month, I dive into a specific topic. Usually this topic revolves around a new investment I am targeting. I essentially take you with me as I meet with industry insiders and show you what I find as I conduct my forensic investigation on the company and its stock. It’s essentially how the billionaire entrepreneur taught me to invest … and now I am passing it on to you. I keep all my latest information on this encrypted site that members can access at anytime, anywhere. A membership to my Real Wealth Strategisttranslates to big gains for people who follow my research. And they are a perfect complement to what’s coming down the pike with these freedom checks and the 568 companies that pay them out. Right now, $34.6 billion is set to be cut in freedom checks. 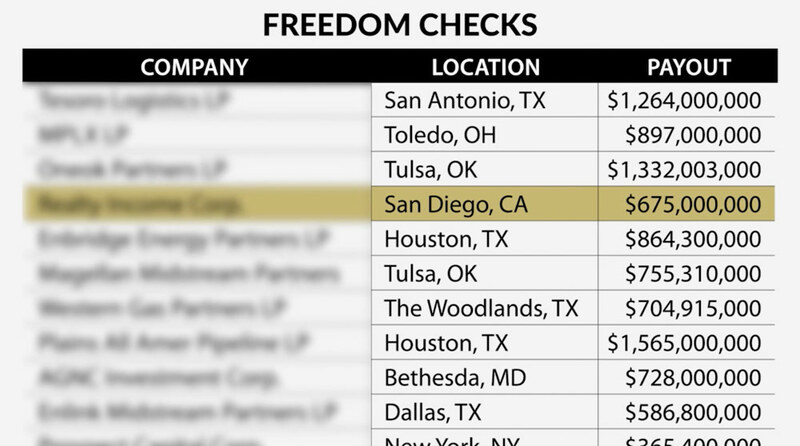 These freedom checks are life-changing. I’ve been showing people these types of opportunities for over a decade. 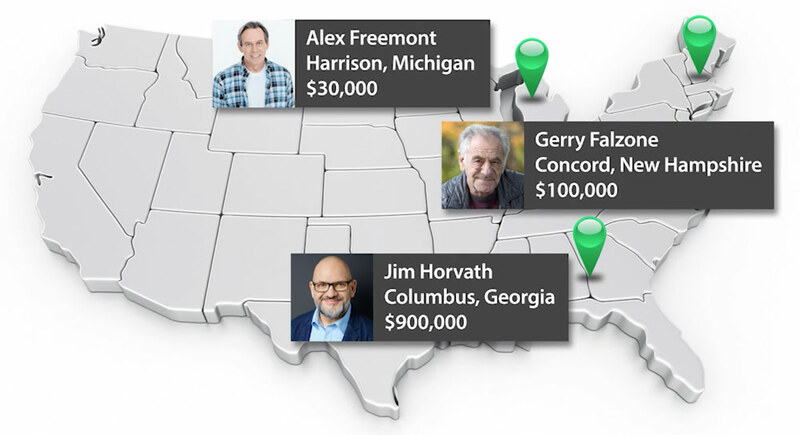 Ken Harding says he is making $60,000 to $70,000, Jay Monson is making over $300,000 and Nick Goetz says he is sitting on a $1.6 million windfall. 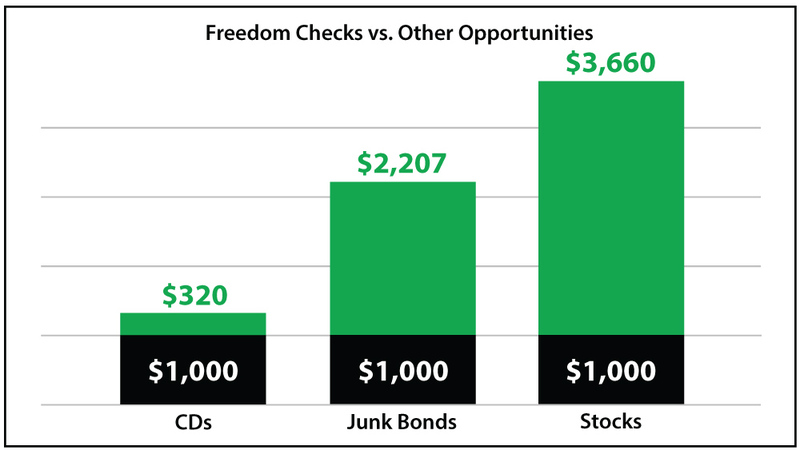 These freedom checks have the potential to pay out vastly more than CDs, junk bonds and stocks. The returns are far superior than what you can get with Social Security, 401(k)s and IRAs. How much you collect will be up to you. 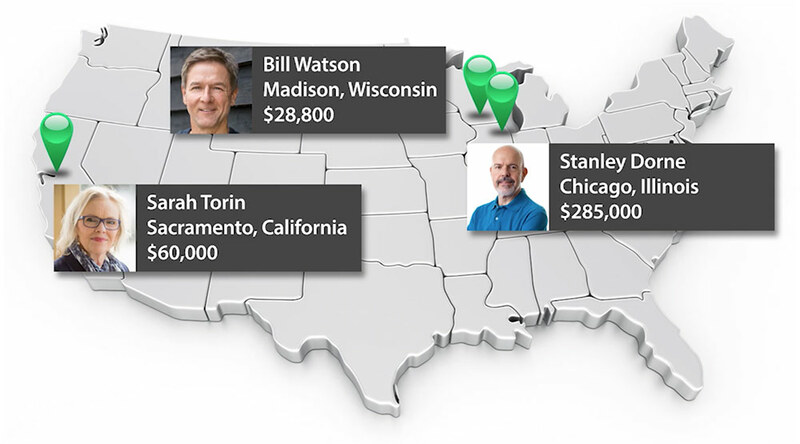 You could make $1,000 a month … $10,000 … maybe even $100,000! But for the best chance to claim your full share, YOU MUST GET STARTED TODAY! And as a new member of Real Wealth Strategist, not only will you get access to my research on these ”Freedom Checks”, you will get access to me and my best investment ideas. As Dan Arrigo writes, “We set a target of $1 Million for our three great grandson's college fund. And thanks to you, by following Real Wealth Strategist we've grabbed $100,000 in less than 9 months." Warren Harrisson said: “You continue to make me money. The freedom check company I own is doing fabulous. Keep up the great work.” And Jason Marley says: “So far, I’m doing much better than expected in my freedom check investment, and I’ve had a long record of success with these type of companies.” Like Dan, Sam, and Jason and others, I know you will be thrilled. With that said, I don’t want anything holding you back from joining today. Which is why I’ve kept the cost to join Real Wealth Strategist at the lowest level possible. A one-year membership is just $199. But frankly, I’m prepared to make sure nothing stands in your way from taking action. So in order to eliminate any and all barriers that could prevent you from joining, I’ve cut the price drastically for the first 1,000 people who take me up on this special invitation today. The price for a one year-membership … is just $47. That’s less than the cost of a typical monthly cable bill. When you consider the three special reports I’ve promised you today are valued $199 each for a total value of $597 — it’s a steal at this price. However ... since we’ve just met ... I’m going to take it one step further. I’m giving you a 100% satisfaction guarantee. 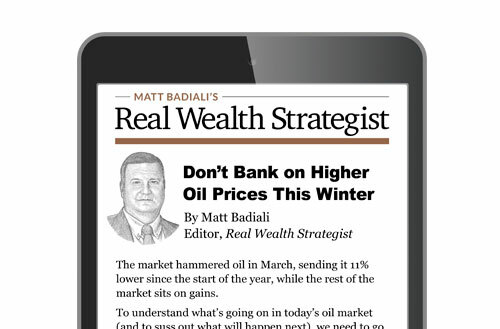 Simply put … when you join Real Wealth Strategist, you have one year to review everything. If I don’t live up to your highest expectations, all you have to do is simply call my team at any point in the next year, and you’ll get every penny of your $47 membership fee back … no questions asked. That’s how confident I am that you will be thrilled with the thousands of dollars in freedom checks you will start receiving. Not to mention the windfall of gains from the handpicked stocks in my model portfolio. Frankly, it doesn’t get any better than that! This offer is available for the first 1,000 people who sign up today! 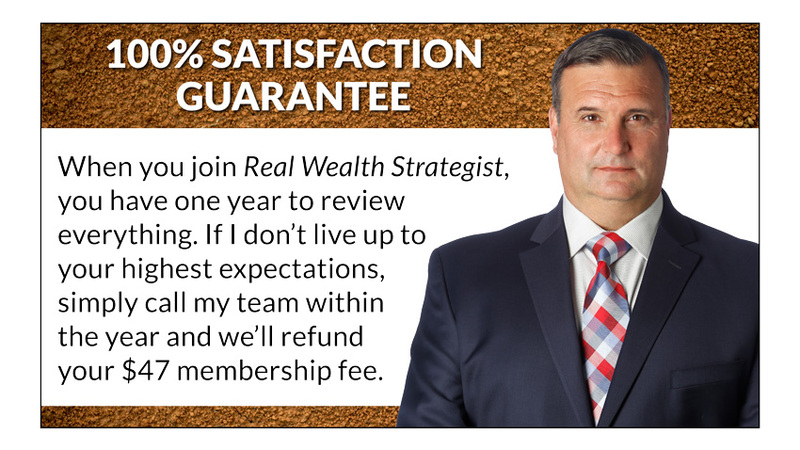 So the best thing you can do right now is to sign up for Real Wealth Strategist while there is still time to take advantage of this once-in-a-lifetime offer. I pledge that I will do my absolute best to find investment opportunities that not only flood your account with massive amounts of freedom checks but also give you the chance for huge profits you will never hear about from the mainstream media, or anywhere else for that matter. Thank you so much for listening to this important presentation, and I sincerely hope you’ll take me up on this exclusive offer. 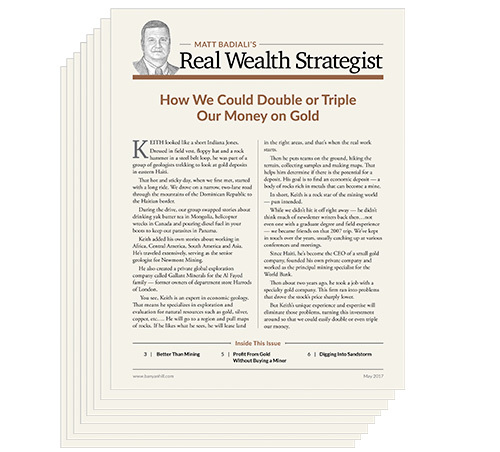 I guarantee that joining Real Wealth Strategist will be one of the best financial moves you’ll ever make. Just think, you are one click away from banking your first freedom checks and life changing profits that will change your financial picture for decades to come. Word of these freedom checks is starting to spread, and those who hesitate will miss their chance to be a part of the biggest cash grab in U.S. history. Just click on the orange button below this video to get started. And I look forward to welcoming you onboard.